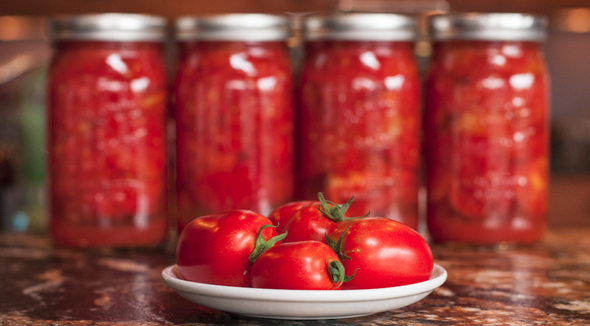 Tomatoes are one of the most popular vegetables grown in home gardens, and canning is a brilliant way to enjoy their flavor throughout the year. Tomatoes need to be preserved correctly to avoid spoilage and to ensure safe consumption by your family. These canning tips should help you avoid the processing errors that can make your hard work a waste of time. There is a great deal of satisfaction to be achieved by growing your own produce, and then harvesting and preserving your home-grown bounty. There is even greater satisfaction when you get to enjoy the fresh flavors of summer in the dead of winter. So, follow the simple tips below, and rest assured that the tomatoes you can today will be just as flavorful and nutritious months from now. There are many things you can make with tomatoes, such as salads, sauces and salsas, but this article focuses only on canning whole, halved or chopped tomatoes. The first thing you should know is how many tomatoes it will take to yield your desired number of quarts or pints. It takes approximately 2.5 to 3.5 pounds of fresh tomatoes to yield 1 quart or 2 pints, depending on whether you chop them. Having a kitchen scale can take a lot of the guesswork out of knowing how much you'll actually end up with, but experience is the best teacher. Whether you can in pints or quarts will depend on the size of your family, the way you plan to use the tomatoes, and how you are preserving them (whole, halved or chopped). Your tomatoes should be vine-ripened, not bruised, and should have no sign of spoilage. You should not can overripe tomatoes or those that have been subject to diseases or insect or worm infestations. If you can store-bought tomatoes, use the recommendation below for adding lemon juice or citric acid. Tomatoes from the grocery store have usually been picked early and allowed to ripen off the vine, making them less acidic. You will need clean and sterile canning jars. You may be able to find boxes of canning jars at garage or yard sales or even on Craigsist, which can save you a lot of money. If you go this route, check the rims for chips and rust and the jars for cracks, and discard any with these imperfections. If the jars have a white discoloration, don't even consider using them. Your jars should be free of staining and look new, once washed. You should also only buy jars meant for canning by Ball, Kerr or Mason. The name will be displayed on the jar. The screw-bands can also be bought second-hand or acquired from other people, but the lids or seals must be brand new or never used. The only way you can guarantee that is by buying a factory-sealed box of lids or by using lids you have personally purchased new. The screw-bands should not be dented or rusted. Your jars should be washed with soap and very hot water (in the dishwasher is fine), even if they are brand new out-of-the-box. Rinse them really well. You want them to be sterile when you fill them, so you want to keep them hot. I put them in my canner and fill the jars with water and keep the water level over the top of the jars and bring them to a boil and then reduce the heat until I'm ready to use them. As I use them, I pull them out of the water with a pair of tongs, emptying the water back into the canner and filling the jars as I go. Now my canner is already full of almost boiling water, which I can bring back to a boil quickly when putting the jars back in to process. This method leaves much more room in your kitchen and on your stove and leaves one less pan to clean up! It's also best to wash the bands, but they don't have to be kept hot. The seals or lids, on the other hand, should be kept very hot. I place them around a saucepan, alternating lids by placing some up and some down, just because it keeps them from nesting. I cover them with water and heat them until the water is starting to steam and then lower the temp on the burner to keep them hot until I need them. You should not boil the lids. A magnetic lid lifter is one of the cheapest and most valuable tools in my canning arsenal. Tomatoes can be highly acidic, so you might want to consider wearing rubber gloves of some kind. I prefer the doctor type because they come in sizes that fit my small hands and they make the jars and lids easier to handle. Green tomatoes are more acidic than ripened tomatoes but can be canned using the same method. Once you've canned tomatoes without gloves, you will probably never do so again. Wash the tomatoes well and drain. A large colander is handy for this purpose. Use a large slotted spoon to dip the tomatoes, one by one, into a boiling pot of water. You can use a small to medium saucepan for this. Count to 30 or 60 seconds or until the skins split, then dip quickly in ice cold water. This will loosen the skin, making it really easy to remove. Cut out the stem and the white core beneath the stem, peel the skin off and trim off any obviously bruised or discolored areas. Fill the jars with tomatoeswhole, halved or choppedincluding any tomato juices that are made while slicing them. I use a plastic, flexible cutting board and a jar funnel for this purpose. Once the jars are full, add enough hot water or hot tomato juice to leave 1/2â€³ headspace, which is the space between the food and the top of the jar, to allow for expansion as it is processing in the hot water bath. Then remove any air bubbles by using a non-metallic spatula inserted between the jar and the food, slowly moving the spatula up and down as you turn the jar one full circle. Add more liquid to adjust the headspace if necessary. Use a wet clean cloth to clean the rim of the jar, put a hot seal or lid on the jar and add the screw-band. You only need to finger-tighten the band firmly; don't use a hard twist. Place in the canner, bring the water to a boil and then time for the recommended time for your altitude. You can either use a water bath or pressure canner, both of which should come with recommendations. You can also search online for recommendations from the USDA or from your local college extension services. Once the jars are processed for the correct amount of time, use a jar lifter to remove them from the water and place them on a rack, a towel or on newspaper. Don't place them on a cold, hard surface, as they might crack from the temperature difference. When you start removing them, you are liable to hear metallic pops as the lids start sealing. (This always makes me smile.) It can take up to 24 hours for all of the lids to seal. Leave the jars alone and don't be tempted to push on the tops of the lids to test the seals before the 24-hour time limit is up. The center of the lid should be slightly concave and not move. If it is slightly convex and pops when you push it, the jar did not seal and you should reprocess* it immediately or discard the contents. If the jars are sealed, you may remove the screw-band, if you wish, label the jars with the date and the contents, and move them to a cool, dry, dark place, although you may be tempted to just leave them out for a few days to admire your work. *You can reprocess any jars that did not seal by putting the contents into a pot. Heat the contents just to boiling and then repeat the process for your selected canner. If they still don't seal, discard that batch. You should also be aware that re-processing can result in a lessening of the Vitamin C and Vitamin B-complex and may also result in a slightly different texture. It's kind of like reheating leftovers. You should also discard the contents of any jars in which the seals fail after a number of days or after a number of months. Some people make sure the acidity level of their tomatoes is up, which makes doubly sure that the processing will result in safe edibles, by adding 1 Tablespoon of bottled lemon juice or 1/4 teaspoon of citric acid per pint, or 2 Tablespoons of bottled lemon juice or 1/2 teaspoon of citric acid to a quart of tomatoes. You can add this to the bottom of each jar before adding the tomatoes and liquid, though it is usually not necessary when you are using high quality tomatoes right from your garden. Once you get the hang of canning, you can experiment with new recipes on your own, maybe adding fresh herbs or onions to your tomatoes. You can search online for a recipe that sounds good to you and you will probably be presented with dozens, if not hundreds, of possibilities. The most important aspect to canning is that you have fun and that you do so safely. Your canned goods should be much better than commercially prepared foods. Enjoy!